This project required use of a manufactured metal component. I used a ring blank, a bezel cup and some small fine silver balls. I really liked the shape of the top piece and the element with the stone.The main piece was made as a tube and then cut at an angle. The element that sits inside with the stone on the top was made the same way and again cut at an angle. I used course grains of metal clay stuck to the inside with slip for the texture. The ring shank was covered with textured metal clay. Under the edges of the top piece there are more small silver balls nestled in against the top and the ring shank. After firing, the inside of the top had a patina added using Liver of Sulfur. Finally a bullet cabochon was set into the bezel cup. I felt this ring wasn’t really wearable so I created it as a scarf ring. It didn’t score very highly with the assessors, it just scraped through with 7 out of 10. 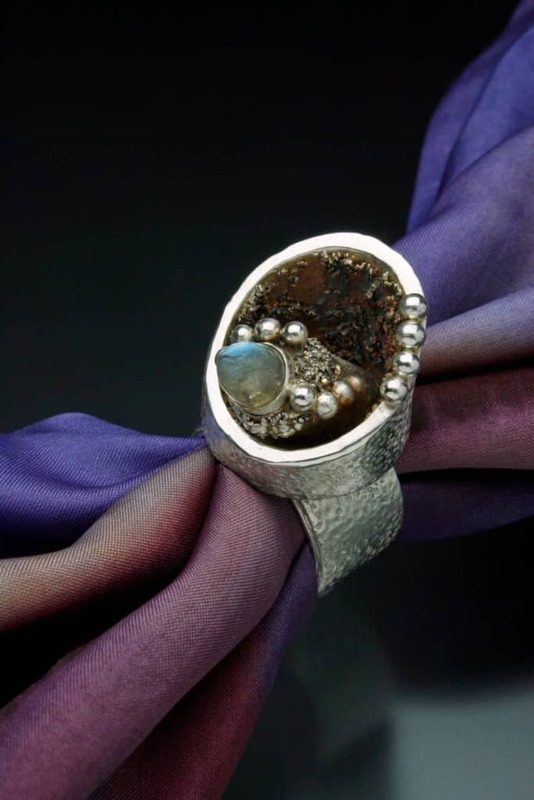 Use metal clay to make a wearable object that includes a manufactured component such as a fine silver or sterling ring blank, stainless steel or fine silver mesh, commercial findings, etc. This use should go beyond, for instance, simply including a bezel cup.